During the last two weeks, we solved the IR compatibility issue on testnet. The new version of NR, DIP and NBRE were deployed on testnet as well. So far, it works well. Nebulas Explorer will provide the the details and leader board of Nebulas NOVA testnet Developer Incentive Program. NAS nano Pro passed a new round of code audit and attack testing conducted by ZDCY security company. 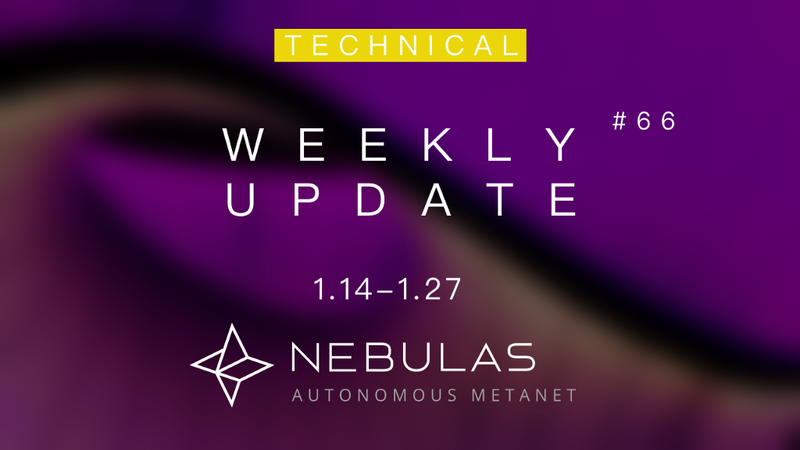 Welcome to Nebulas Weekly Report #66, delivering the latest updates on the Nebulas project. This report is maintained by the Nebulas team. Please send feedback to contact@nebulas.io, or tweet us @nebulasio. Notes: To facilitate community members, Nebulas team has adjusted the weekly report, breaking it into community dynamics and development updates. The two parts will be alternately released on a weekly basis. Nebulas Bi-Weekly Development Commits #66 was originally published in Nebulasio on Medium, where people are continuing the conversation by highlighting and responding to this story. About Nebulas NOVA, how well do you know?